This tab contains settings of the Apache Web server. It allows you to enable/disable HTTP/HTTPS access to the Web interface and change SSL certificates or SSL private key files. The Password Protection section allows to protect Web interface with password. The password can be changed on Access Password page. If you select the checkbox to enforce the protection, you will be asked for the password once the Web interface is opened in the browser or if navigating the Report tab in the client GUI. The SSL Certificates section contains path to the server certificate, path to the private key, path to the CA certificate and path to the chain certificate file. 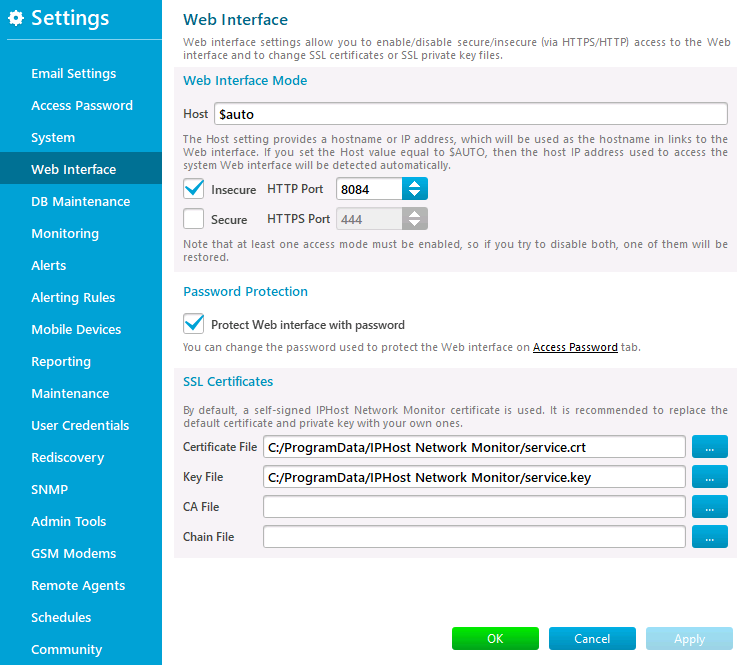 Self signed IPHost Network Monitor certificate is used by default. It is recommended to replace default certificate and private key with your own ones. Note: If you change any setting in Web Interface Mode section or SSL Certificates section, the Apache Web server configuration is updated accordingly and Web server will be restarted.